At the beginning of 2014 the Madeira River, the largest tributary of the Amazon, reached record heights and caused the worst flooding for a century across large areas of north-west Brazil. 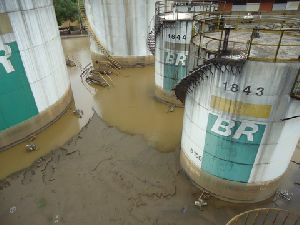 The water level exceeded the 1997 record level of 17.52 metres by more than seven metres, flooding the homes of 3,500 families as well as the TEVEL Porto Velho Terminal tank farm for more than three months. During this time, all the installed equipment, including 24 Rotork IQ electric valve actuators, was completely submerged. When the flood subsided, all the equipment had to be inspected for water damage before it could be returned to service. In spite of the severity of the flooding, all of the Rotork actuators were found to be fully functional with no mechanical or electrical damage and no evidence of ingress. The site service technicians only had to replace internal batteries that maintain the local position indication display during periods of power loss. In some cases water had entered the actuator terminal compartment through the cable entries, but had been prevented from reaching any electrical components inside the actuator by the O-ring sealed terminal bung. This feature, known as double-sealing, has been the standard design on Rotork electric actuators since the 1960s. In the 1990s its impact on reliability was further enhanced with the introduction of the first IQ intelligent ‘non-intrusive’ actuator, enabling settings and commissioning to be performed externally with a hand-held wireless setting tool. Now in its 3rd Generation, Rotork IQ technology has undergone continuous development and refinement to facilitate unparalleled operational functionality, including information-rich datalogging, enabling valve diagnostics, preventative maintenance and life-of-plant asset management. Find out more about Rotork IQ technology.